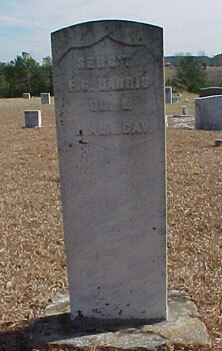 Francis C (Gerry) "Frank" Harris was born 21 February 1826 in SC. He married Delila M Barton, sister of Jonathan, Gilford, James, Madison, and William H Barton. Delila's sister, Sarah, married Jesse D Hyde, also a member of the First. He died 1 March 1897.